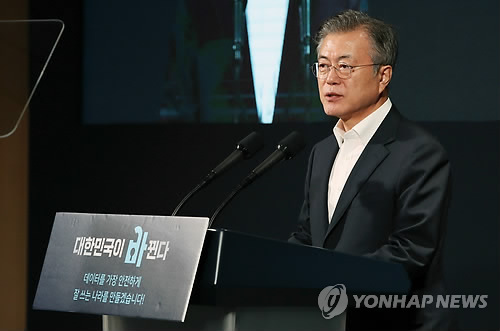 SEOUL, Aug. 31 (Yonhap) — President Moon Jae-in vowed additional government support for the data industry Friday, stressing the need to develop big data into the country’s new growth engine. “The government will fully support the data industry as part of efforts to revitalize our economy. We will establish a new expressway of data in the era of data as we built the Gyeongbu Expressway in the era of industrialization,” the president said. “Now, the Republic of Korea must become a nation that best handles the Internet, a country that best processes data,” Moon told the meeting, noting the country ranked 56th out of 63 countries reviewed for their digital competitiveness in a recent study by a Swiss college. At the meeting, the government announced plans to invest 1 trillion won (US$899 million) in the data industry next year. “The importance of protecting personal information can never be overstated,” he said. “Under any circumstances, the government will work to expand the use of data, but more actively protect personal information by enhancing safety measures,” the president added. South Korea aims to improve big data technology by up to 90 percent of the level of developed countries through a concerted deregulation drive and investment efforts.